After these functions have completed, volume and archive information is available to Robot Save and can be used for restoration. The volumes then can be released into the scratch pool as they expire. 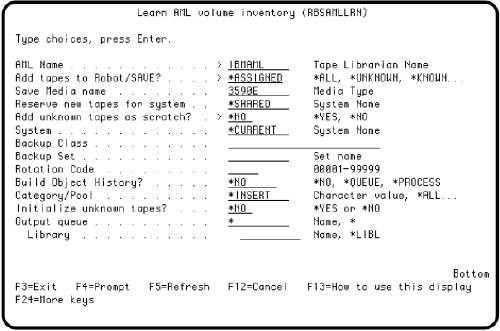 The command also is used regularly to import tapes from outside the AML and place them in the ROBOTSAVE category as they return from archive. Install Robot Save on your IBM i. Follow the online installation instructions. Configure Robot Save to use your IBM AML. For more information, see the Robot Save User Guide and also IBM Automated Media Libraries on our website. Set up Robot Save classes, sets, and rotations. Place the volumes into the category you will use with the command. This is usually the *INSERT category. Add the libraries RBSPGMLIB and RBSDTALIB to your library list. Complete the command parameters with the information for your system. If you are importing tapes that already are known to Robot Save into the AML, enter your AML name, use the default command parameters, and leave the Backup Class and Backup Set parameters blank. If you need additional information about the command parameters, press the Help key to display the command help. If you want to initialize new or blank volumes to the barcode, you must specify *INSERT as the category. When the RBSAMLLRN command completes, the display shows the changes made to the volumes in the AML. If the RBSAMLLRN command was submitted to batch, it also produces a report (RBS414P) showing the same information. All IBM AMLs except the IBM 3494: After you run the RBSAMLLRN command on one system in a data center, you must run the RBSAMLSYNC command on all other systems in the data center that share the AML. The RBSAMLSYNC command moves the volumes to the proper category in the AML unit as defined on each system. If you stop the RBSAMLLRN process before it completes and have specified *QUEUE on the Build Object History parameter, you can use the RBSADDALL command to continue and complete the process. Enter the following command; you do not need to specify any command parameters. You do not need to run the RBSADDALL command if you are not creating object history. If your IBM i systems are set up in a data center, you should run the RBSAMLLRN command on each system that shares the AML as soon as it is included in the data center.